The Dry Air Supply (DAS) technology is a simple, low maintenance compressed air drying system that provides water-free, compressed air and ensures that the compressed air system pipework, main receiver and components downstream of the drying module are free of liquid water. Liquid water generation in compressed air systems is part of the compression process and can lead to the great majority of technical, maintenance and process issues. In certain high end/value applications where only low and very low levels of water content can be tolerated e.g. instrument, medical and food grade air, water removal is addressed using standard air drying technologies. However, for the majority of home and small business users, that only require the removal of all liquid water, the currently available technologies result in over-dried air; an additional unwarranted capital expenditure, maintenance and operational cost. In addition, the DAS technology can be used in conjunction with existing drying technologies as a pre-dryer; increasing the efficiency and decreasing the sizing requirement of these expensive technologies. The main purpose and unique feature of this system is that water is removed from the compressed gas at the earliest opportunity and in the most efficient manner. Removal of water prior to the receiver and the provision of unsaturated air to the receiver ensures no liquid water is present in the system. DAS technology provides a pressure and temperature controlled environment before the main receiver that removes water from the compressed air. This isolated environment, complete with its simple control system, enables the dryness level of the air to be controlled. Control of the dryness level of the air enables it to be matched to a number of different air applications (blasting, spraying or air power tools). Although, in most cases, it would be expected that the user would always want water-free, dried air the air can be further dried in order to better suit a spraying or blasting application. Since the air is dried prior to being passed to the receiver the isolated environment acts as a buffer, Fig.1, ensuring that pressure drops and compressor loading have NO effect upon the dryness level of the delivered air. See here for a simple description of what happens in the real world. 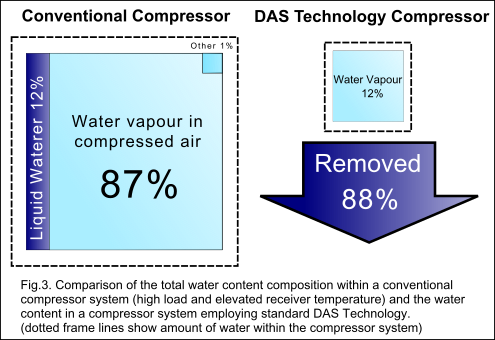 As the main purpose of the Dry Air Supply (DAS) technology is to remove water from compressed air, an indication of its effectiveness can be seen by comparing the total amount (%) of water removed from the compressed ambient air. The left most image in Fig.2. indicates the composition of water in a conventional air compressor system following compression. It can be seen, under low load conditions, that about 67% of the water will be in the form of liquid water collected in the receiver, 30% in the form of water vapour in the compressed air and about 3% liquid water in the other parts of the system (pipework, drain, oiler, tooling etc.). The actual mass of water contained within the receiver will depend upon how regularly it is drained. Given that this task is usually only loosely controlled it is not unknown for this liquid water to be blown directly around the system. In addition, the continual accumulation of water in the receiver reduces its storage capacity leading to a further reduction in user experience; more frequent compressor pressure cycling with an ever increasing total take up of water vapour in the compressed air. The dotted frame around this image indicates that unless some action is taken to physically remove the water it will remain within the compressed air system and given its location keep the compressed air in a saturated state. The right most image in Fig.1. indicates the water situation when the DAS technology is used. Since the water is removed at the earliest opportunity and in a controlled manner there is no liquid water present within the receiver or any of the other system components. In addition, the water vapour present within the air is below saturation i.e. the dew point temperature of the compressed air is below ambient, so the water will always remain in the vapour state keeping the compressed air system dry. Fig.3. shows a similar situation, in this case the air in the receiver is 15oC above ambient and the regulated output pressure has dropped, due to loading, 2 bar below the set value. In this case it can be seen that the percentage of water in the vapour phase in the compressed air has significantly increased (30% to 87%); this is the water that is transferred by the compressed air into your tooling, paint mixture of grit blasting tank. 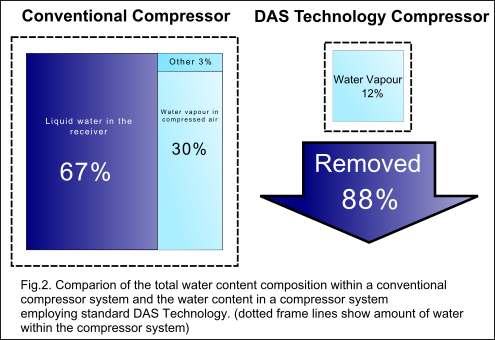 In comparison, the water removal figures for the DAS system, right most part of Fig.3, indicate that as the liquid water is removed prior to the receiver there is no increase in water vapour content of the compressed air. Liquid water removal without the use of a refrigerant cooler. Increased and consistent receiver storage capacity. Simple, easy- to-use dryness level control. Low cost and low cost of ownership. Scaled to fit all load demands. Only operates when the compressor is on. Passive enhanced DAS system available for even better dryness. No in-line water drains required. No chance of direct water entrainment. Works in conjunction with other water removal technologies to improve overall efficiency and effectiveness. The DAS Technology has been designed to operate with compressors of below 10HP although should be possible, with suitable design effort, to provide effective drying above this level. It operates best with piston compressors that have low and intermediate, indeterminate loads. Whether the DAS technology comes as part of a combined compressor system or as a simple bolt on module the cost of purchase and ownership is low in comparison to the first accessible air drying technology, fridges. As the system is inherently simple to operate and uses well understood and characterised technologies it is both easy to install and operate and, in the very unlikely event of failure, repair. It uses no refrigerant consumables, contains no coolant compressors or high pressure valve technologies and does not require any regular servicing contracts. In fact the technology, once purchased, should last as long as your compressor and be simpler to maintain. 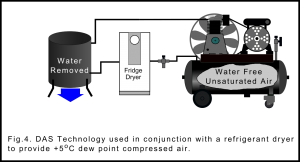 As the inlet temperature to the fridge is cooled the efficiency of the fridge is increased. As the fridge operates under a constant elevated pressure its efficiency is further improved. As the fridge is directly connected to the compressor, through the DAS Technology, the flow rate through the fridge is constant. These factors allow the selection of a smaller, more economic refrigerant system. Similar arguments are possible if a membrane, adsorption or absorption based dryer system are used in conjunction with the DAS Technology.